WELCOME to the homepage of conductor Ming Luke, current Principal Guest Conductor of the San Francisco Ballet. Join Ming’s mission to connect and collaborate with creatives across disciplines to deepen the impact of music for a global audience. 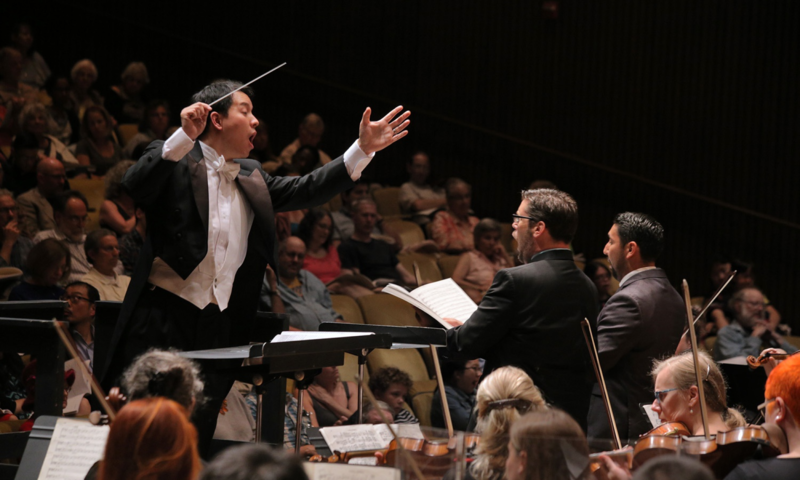 With the “energy, creativity and charisma not seen since Leonard Bernstein” and “vibrant,” “mind-blowing,” and “spectacular” conducting, Ming Luke is a versatile conductor that has excited audiences around the world. Highlights include conducting the Bolshoi Orchestra in Moscow, performances of Romeo and Juliet and Cinderella at the Kennedy Center, his English debut at Sadler’s Wells with Birmingham Royal, conducting Dvorak’s Requiem in Dvorak Hall in Prague, recording scores for a Coppola film, and over a hundred performances at the San Francisco War Memorial with San Francisco Ballet. 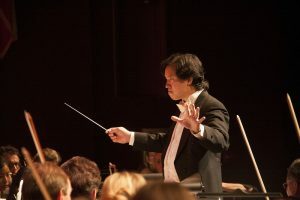 He has been recognized nationally for his work with music education and has designed and conducted education concerts and programs with organizations such as the Berkeley Symphony, Houston Symphony, Sacramento Philharmonic, San Francisco Opera and others. Luke has soloed as a pianist with Pittsburgh Symphony, Sacramento Philharmonic, and San Francisco Ballet, and currently serves as Music Director for the Merced Symphony and Berkeley Community Chorus and Orchestra; Associate Conductor for the Berkeley Symphony; and Principal Guest Conductor for the San Francisco Ballet. Long time critic Allan Ulrich of the San Francisco Chronicle said, “Ming Luke delivered the best live theater performance I’ve ever heard of [Prokofiev’s Romeo and Juliet]” and in 2016 Luke’s War Requiem was named best choral performance of 2016 in the San Francisco Bay Area. For the 18-19 season, Luke serves as an Assistant/Cover Conductor for the San Francisco Symphony, opens the Berkeley Symphony’s season, works with the ARIA program with San Francisco Opera, and will return to the Kennedy Center and Sadler’s Wells in London with San Francisco Ballet. Guesting at the San Bernardino Symphony, Billings Symphony, and Opera San Jose, Luke will also embark on a Baltics tour with the Berkeley Community Chorus and Orchestra, a well regarded chorus for whom he is only the third Music Director in over fifty years. Luke has written, arranged, and performed over 150 education concerts with the Berkeley Symphony and has served on grant panels for the National Endowment of the Arts and the Grants and Cultural Committee of the Sacramento Metropolitan Arts Commission. An exciting pops conductor, Luke has created and conducted a variety of pops concerts in many venues, from baseball stadiums, to picnics in the park with over 4,000 people in attendance, traditional concert halls and recording for Major League Baseball. Read what the press has to say here. Ming Luke offers several programs geared towards children and families. All of the performances that he has developed adhere to state and national curriculum standards in music. To bring one of the example concerts below to your orchestra, or to collaborate with Ming on a new program, please contact him. America is the great melting pot, but what does that mean for the American Symphony and classical music? Explore how all the various cultures that make up what it means to be American come together in music to make our distinctly American musical sounds. With favorite works from Bernstein, Copland, Gershwin and more, this educational and fun concert will show you the crossing of musical styles that created today’s American music. Who Messed Up My Orchestra? Famous maestro Rusty van Beethoven, descendant of Ludwig van Beethoven, has come to perform his great ancestor’s Fifth Symphony. But something is wrong – the orchestra members are all jumbled up! Learn about the different sections of the orchestra in this hilarious and educational show as Rusty tries to figure out how to rearrange the orchestra so that he can perform Ludwig van Beethoven’s Fifth Symphony. I’ve Got Rhythm, No Wait I Don’t! Famous soprano Carrie Hennessey will now sing Gershwin’s famous song I’ve Got Rhythm. But something is wrong–she’s lost her sense of rhythm! Join us in this hilarious exploration of the difference between tempo and rhythm as Carrie and the orchestra try to regain her sense of timing again. Students and families will explore all sorts of famous rhythms and tempos through the repertoire of Bizet, Marquez, Haydn and more! Haydn Symphony 94 2nd mvt. Boom! Crash! Bang! There are dozens of different types of percussion instruments that are used in orchestras – this concert includes everything… and the kitchen sink! Anything you hit, shake or scrape can become a percussion instrument – explore the wacky history of percussion instruments. Hear when Beethoven had a Turkish Army walk through his Ninth Symphony, the resounding power of the timpani in the finale of the Dance Bachannale, and, who knows, maybe you’ll join us on stage to play for Mozart’s Toy Symphony! To see a list of Ming’s past engagements, click here. Evening performances unless notated “m” for matinee.